Recently, we shared the news that Vermont’s Stowe Cider was releasing a CBD cider, a development we are feeling pretty stoked about. Well, it’s looking like the craft cider industry is at a bit of a tipping point, because Cider Creek Hard Cider just announced on its Facebook page that it, too, will launch a CBD-spiked cider. This one, which is being released in cans, is called Nano Juice, and is a collaboration with The High Expedition, a dispensary in Alaska. Nano Juice is a non-alcoholic sparkling cider made with New York State apples. It contains 10 milligrams of high-quality, organic CBD (cannabidiol sourced from Colorado-grown industrial hemp) which will shine through without the effects of booze. Remember, CBD doesn’t contain any of the psychotropic compounds that many associate with a “high.” This CDB is TCH-free, so the effects, as many people experience them, are a sense of heightened focus and mental clarity and, sometimes, an easing of chronic pain and anxiety. The High Expedition’s Nano CBD has 100% bioavailability (compared to 20% bioavailability with most CBD oils) and is tasteless and odorless. We’re thinking Nano Juice sounds like the perfect beverage to sip while you’re attacking a big term paper, cleaning the house, on a road trip, or, let’s be real, pretty much any time! 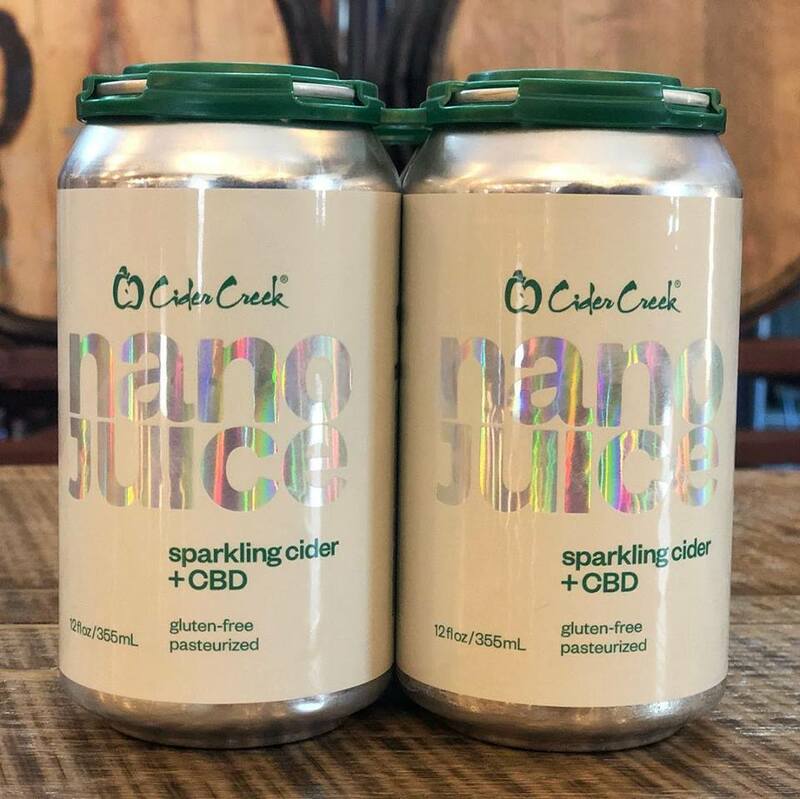 Cider Creek’s co-owner and head cider maker Kevin Collins says he’s wanted to release a non-alcoholic cider for awhile, and with the growing popularity of CBD products, thought Nano Juice would be a great way to introduce something unique to the market. Cider Creek Hard Cider, with a production facility in Canisteo, New York and a satellite tasting room in Hammondsport, New York (both in the Finger Lakes region), is GLINTCAP’s most awarded New York State farm cidery. Its core line consists of four year-round ciders: Premium Farmhouse, Saison Reserve, Cran Mango Saison and Loganberry. Its products are distributed in New York, Massachusetts, Pennsylvania, Vermont, Connecticut and Rhode Island, and Nano Juice will be available in New York in the next week or so. Use Cider Creek’s product finder tool to identify a distributor near you, or just head to one of its locations! Cider Creek Hard Cider is located at 49 Shethar St. in Hammondsport, NY; phone: (607) 224-4174; and 6459 Cunningham Creek Rd. in Canisteo, NY; phone: (607) 301-3244.